Posted on Fri, Jan 28, 2011 : 3:42 p.m.
A division of information services giant Thomson Reuters plans to create a legal services operation in Ann Arbor, according to an online job posting that is circulating in the legal community. Thomson Reuters, which maintains a major operation on Eisenhower Parkway in Ann Arbor, is hiring lawyers to staff the new operation, according to the Monster.com job posting. 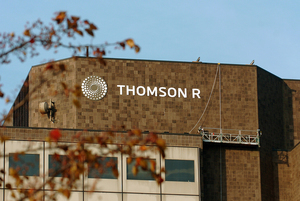 Thomson Reuters in 2008 replaced the old "777" sign on its corporate facility on Eisenhower Parkway with its logo. The facility would be part of the company's Pangea3 division, which provides legal services to corporations and law firms. Thomson Reuters in November acquired Pangea3, which has 650 employees based mostly at two operations in India. "Pangea3 is hiring to build multiple document review project teams," the job posting says. "We are seeking contract attorney candidates barred in any U.S. jurisdiction with previous document review experience. Pangea3 is hiring in anticipation of establishing a document review facility in Ann Arbor, MI." Two spokesmen for Thomson Reuters could not be reached for comment this afternoon. It's unclear how many lawyers the company plans to hire and whether they would be based at its existing facility. The jobs would start around March 1, according to the job posting. "As we've mentioned, we see a multishore, 24/7 operating structure as key to supporting Pangea3 customers in all parts of the world," a Thomson Reuters spokesman told the American Bar Association Journal in an e-mail. Pangea3, which has dual headquarters in New York City and Mumbai, India, has capitalized on a trend in which some law firms and corporations are outsourcing some legal services to specialized companies. Most of Pangea3's legal services are based in India. But after the Pangea3 acqusition, the ABA Journal reported that Thomson Reuters would establish Pangea3 legal centers in the U.S. because some law firms wanted to outsource some services but were "wary of offshore-only entities." “Pangea3 is true to our mission to help the legal system perform better, every day, worldwide," said Peter Warwick, president and chief executive officer of Thomson Reuters Legal, in a November news release. "We will now bring to the legal marketplace a responsive, high-quality, transformative resource for a broad range of legal support work. This is particularly important as law firms and general counsel adjust to the realities of the ‘new normal,’ where efficiency, quality and responsiveness are paramount." Sat, Jan 29, 2011 : 2:01 a.m.